Never before this election have I seen more people publicly shouting their political outrage. It is inescapable. Long impassioned Facebook posts, mass-retweets, exciting headlines on reddit. I’m not sure what they believe they’re accomplishing. Do they think that tossing another rock into their echo chamber is going to somehow change things? Will this be the tweet that “wakes up” Trump supporters through cutting wit and revolutionary insight? Not only is it pointless, it’s depressing. Anyone with liberal-leaning friends can hardly go on social media without starting to believe the world is about to end. And, yes, I’m mostly picking on liberals in this post. I didn’t support Trump, but there’s absolutely no excuse for the amount of public whining that’s going on. And with how psychologically damaging it is to be exposed to, the best thing you can do for yourself is escape it. Subjecting yourself to further outrage from people who think the world is falling into the maw of Satan is doing you no good. It will only frustrate and exasperate you while deepening your tribal mindset and disbelief that any functioning human could hold different beliefs from you. Worse, it’s so attractive to get involved. You see some woefully misinformed person spewing their own brand of nonsense and you can’t help but jump into the fray and point out how wrong they are. Surely they will thank you for educating them, right? I wish I were above this instinct, but I’m not. The idea that you’re being more informed, or being a good citizen, by staying up on this outrage is nonsense. You’re only playing into the skillfully dealt hand by media companies that have learned what gets clicks, eyes, and keeps you in perpetual fear that annihilation is only a tweet away. Here’s how you can escape it and get some of your sanity back. The news was a massive waste of your time before this election, and now it’s ten times worse. Throughout the election process, reporters learned that news about Trump got the most engagement, so they kept publish it. 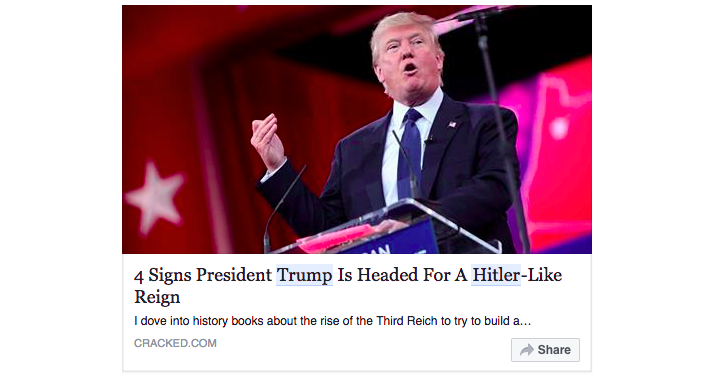 News about what a galavanting deplorable he was did especially well, playing into viewers’ existing beliefs (nay, certainty) of his inner Hitler. I shouldn’t have to tell you that anything (TV news, newspapers, periodical blogs) that has to publish on a schedule is going to publish mostly useless or repetitive information. There aren’t enough important things happening to justify a 24-hour news cycle. If news companies gave you unbiased information in an efficient manner, they’d be out of business. What we’re left with is a nonstop news cycle of mostly useless information, geared towards scaring you into believing the KGB will be at your door any moment now. The solution? Cut it out, all of it. No more morning or evening news. No more web news. No more newspapers. Read a book instead, preferably an old one. Trust me, if something serious happens someone will tell you. Recommending you ditch following the news may not apply to you. It’s more likely that, like most people, you don’t follow a news roll but rather see what surfaces on social media and then read that. This is an even worse way to get your information. What shows up in your feed will be largely determined by your past preferences and what’s most clickable, which means you will only see articles that play into your existing beliefs (and fears), and ones that have been structured in such a way to get you to click on them. Guess which two are getting a lot of play right now? What shows up in your Facebook feed is what gets the most activity, which is determined by what can inspire the most fear and outrage in people who you share beliefs with, which means it’s going to be horribly biased one way or the other. Worse, many people will share these articles just based on their titles, without ever reading them or digging into the research, so you’re actually becoming less informed. The absurd trust in organizations that make money by keeping you scared and clicking on things is rapidly leading to a dumbing down of our understanding of the world, and ability to intelligently question it. Install “FB Purity,” a plugin that will let you disable parts of Facebook. 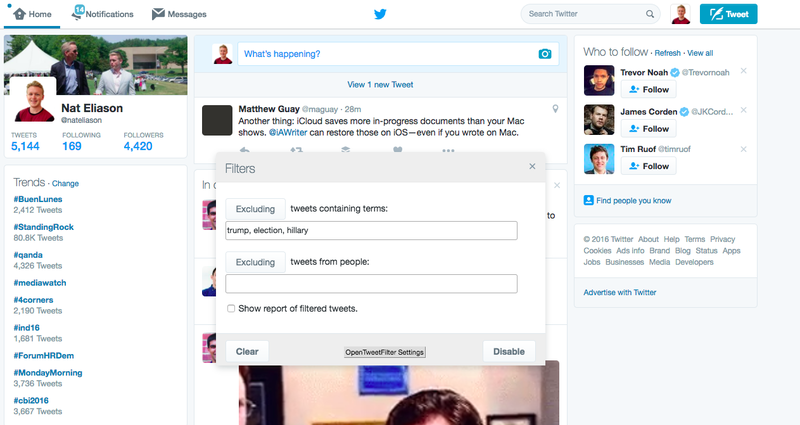 Turn off the trending news on the right side, the news ticker, and add keywords that it should filter out of your timeline (like “Trump,” “Hillary,” “Election,” etc.). For best results, you’ll also need to remove the Facebook app from your phone. Believe me, the world won’t end. If people get through the filters, you can unfollow them by clicking on the arrow in the upper right of their share box. This will prevent them from showing up in your newsfeed at all. If you want to see stuff from them in the future, leave yourself a calendar date to re-follow them in 3 months when everyone has gone back to not caring about politics. 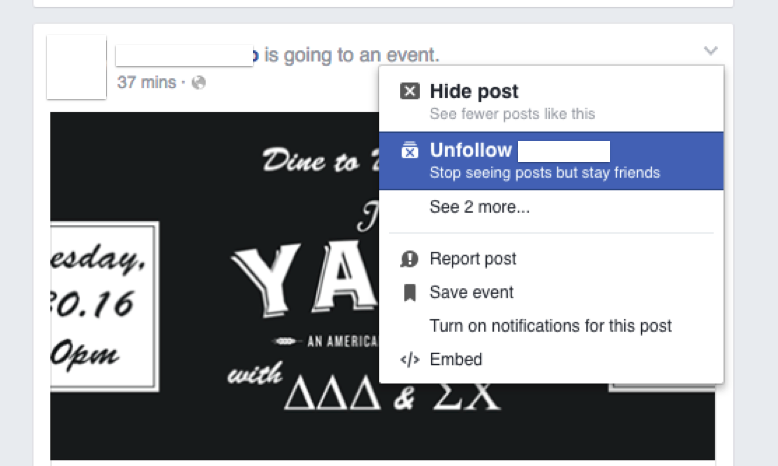 Once you do this enough, you might find that your newsfeed is getting rather empty. Fill the void with pictures of cute animals so that going to Facebook makes you happy instead of pissed off. Start with The Samoyed Siblings, DF Magazine, and Aww Station. The first step with Twitter is to unfollow or mute anyone who is tweeting disproportionately about politics. Though, I will say that there are exceptions. Twitter, in my experience, provides a better forum for reasonable discussions than Facebook, but that could be a function of the people I follow. This way you won’t see anything election related without having to unfollow everyone. It’s especially useful if you like seeing someone’s posts on some topics, but are getting sick of their political ones (looking at you, Chris Sacca). Your trends in the left column will be based on who you follow and who you retweet. So, if your trends get too political, stop reacting to that flavor of content. You can always change your Trends feed to some country where you don’t speak the language, too. If you only go to subreddits you follow, you should be set. The danger is if you go over to /r/all. Just avoid that and you should be fine. These shouldn’t be a huge issue since they tend to be largely visual, but it never hurts to unfollow people turning it political and follow more cute animal pictures. Maybe one day our Magic Leap glasses will let us filter outraged people from our physical existence, but until then, we need to be more tactical. If you’re dealing with a soft acquaintance who seems to want nothing more than to drag you down into their pit of despair, stop hanging out with them or inviting them out places. Hopefully, as they spend more nights drinking alone crafting the perfect Facebook post, they’ll realize that they aren’t educating the world, just pushing it away. For good friends and family, the best thing is to not fight them and try to change the topic as quickly as possible. People who are going on and on about this don’t want to have a reasonable conversation, they want to get attention. You just have to ignore them when they get into it. Give them a confused look and then rapidly change the subject. If you reinforce it by engaging, positively or negatively, you only make the problem worse. It’s like pouring water on a grease fire. Now, with people you don’t know but who seem to want to get into it, you have two options. You can ignore it and walk away, or you can take the much more fun route and make them angrier. These people have worked themselves into a frenzy of outrage, so instead of letting yourself be brought down by it, why not see how much angrier you can make them? Pick an absurd stance, pretend you believe it, and start defending it. What do you care if some stranger thinks you’re a climate change denier? Best of all, you’ll get better at debating! Look, I’m not suggesting you don’t be informed. I’m suggesting that you don’t let other people determine how you’re informed. If you truly care, do your own research, getting as close to primary sources as possible. Don’t trust others’ interpretations. And I’m not suggesting apathy, either, rather that you don’t let your emotions be swayed by other people’s outrage. There’s absolutely no use to keeping yourself in an emotional frenzy, especially one you’ve been pulled into by media and other people’s inability to control their feelings. And if you’re part of the problem, cut it out! If you believe there’s some huge injustice being done, then go do something about it. Don’t trick yourself into thinking that slacktivism via Facebook posts and Internet fights is going to change the world.